GreenPed for Yamaha SyncDrive Drive Systems. The GreenPed tuning module is a variant of the well-known BluePed module and it´s made especially for electric bikes with Yamaha SyncDrive engines which are being used in (for example) GIANT electric bikes. The GreenPed device allows you to set the maximum engine support to an individual value from 15 up to 75 km/h (about 46 mph). A great advantage of the GreenPed device is that your electric bike display will still show the correct speed, even if the tuning is activated. 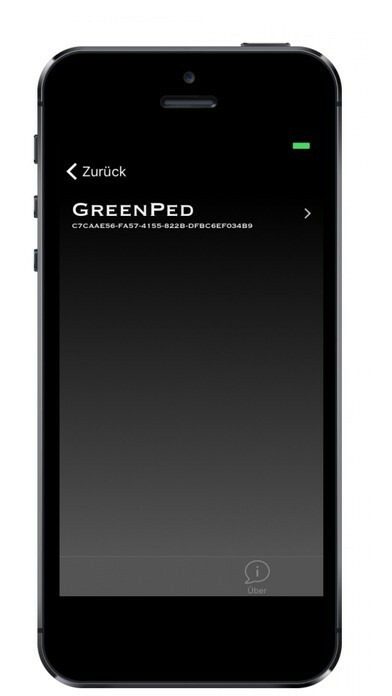 Like the BluePed module, the GreenPed device can be conveniently controlled with a free Smartphone app (Android & iPhone). For this reason, the GreenPed module offers much more setting options than most other electric bicycle tuning tools. For example, you got the possibility to set the wheel size individually or to enter a button code to save the device from unauthorized access. 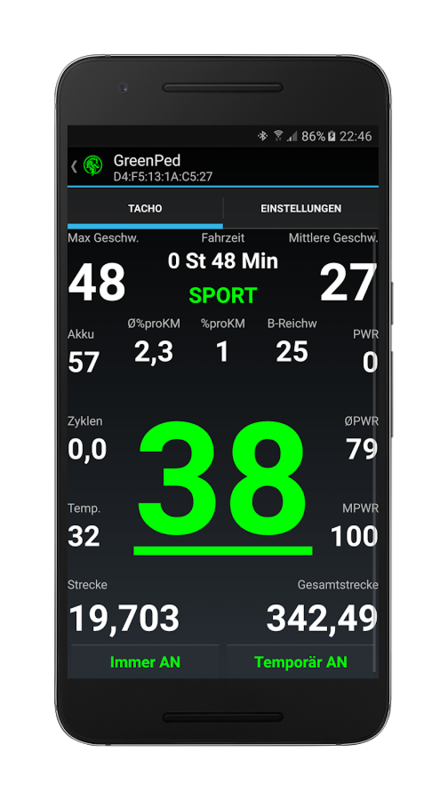 Thanks to the GreenPed app the Smartphone display can show you a very large range of parameters – in fact, even much more than the “normal” electric bike display! You can activate the tuning at any time via your electric bikes light- or menu-buttons or via the Smartphone (you can set an individual button code). 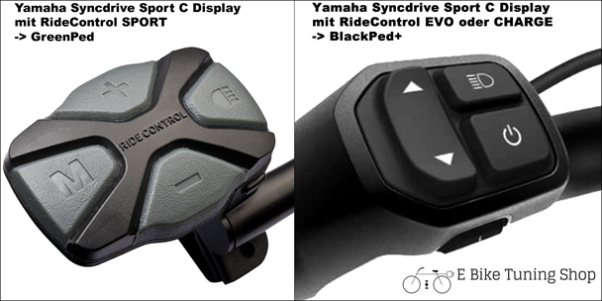 By the way, the original function of your electric bikes light button remains unchanged. Of course, all values can be reset at any time. Contrary to the BluePed module, the total mileage of the GreenPed module does not have to be balanced out anymore (for example, when you want to uninstall the GreenPed module some day). 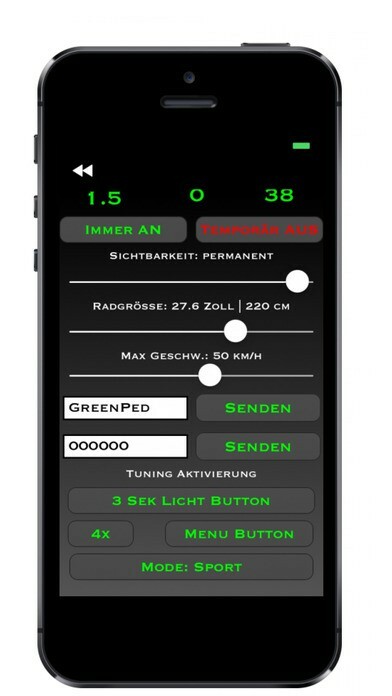 Important hint: In principle, the GreenPed App is only needed to adjust the settings of the GreenPed module. Due to the fact that all settings will be automatically saved, you don´t have to take your Smartphone with you every time you want to use your electric bicycle (like mentioned before, you can switch the module on / off via your electric bicycles light- or menu-buttons). Of course, you can change the settings of the GreenPed module or cancel the tuning completely whenever you want to. The installation of the GreenPed module is very easy and uncomplicated. All tools needed are included in the scope of delivery. Due to the fact that no cables have to be damaged during the installation process, you can restore your electric bikes original state whenever you want to. By the way, the communication between GreenPed app and GreenPed module is wireless via Bluetooth 4.0. - Optional 1 FINN Smartphone holder for your bicycle handlebar (fits all standard Smartphones). - Installation guide and operating instructions: GreenPed Manual (pdf). Our recommendation: Before you buy the GreenPed module, you should download the GreenPed App and check out if it runs on your Smartphone (minimum requirements Android 5.2 and iPhone iOS 9.2). Just installed the Greenped module on my Giant Dirt-E+3 2018 and... wow, it's a totally new bike! Power seems endless. The android app is well made, I've set the max speed to 75km and activation when changing to SPORT mode. Installation is pretty easy, the hardest part is to arrange all the wires inside correctly before reassembly. The build quality of the module is just perfect, so does the packaging. A bit expensive but worth every cent !